In The Heart Of The Central Harbourfront! 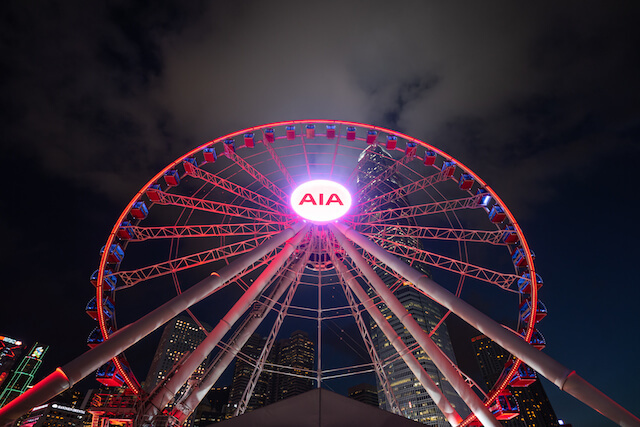 The Hong Kong Ferris Wheel or Observation Wheel as it is officially named, just a stone-throw away from the Central Star Ferry Pier, is giving us just another striking venue from which to enjoy wonderful sweeping views of Victoria Harbour. 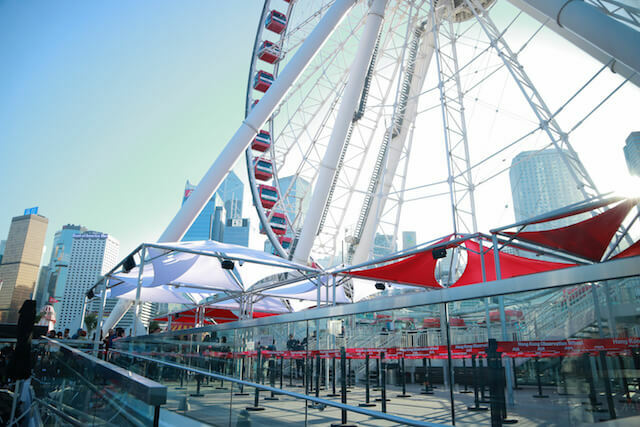 This newest observation wheel is the city's response to England's London Eye and the Singapore Flyer, which also provide some of the best panoramic views in their respective cities. The Hong Kong Observation Wheel is 60 meters high and is easily reached with the MTR Central Station or the Star Ferry. You can combine this attraction with a walk along the Central Waterfront Promenade for some of the most striking views of the harbour and the majestic skyline towering above. But if you want to avoid the crowds, before 4:00 pm is the best time as it starts getting busier after that. 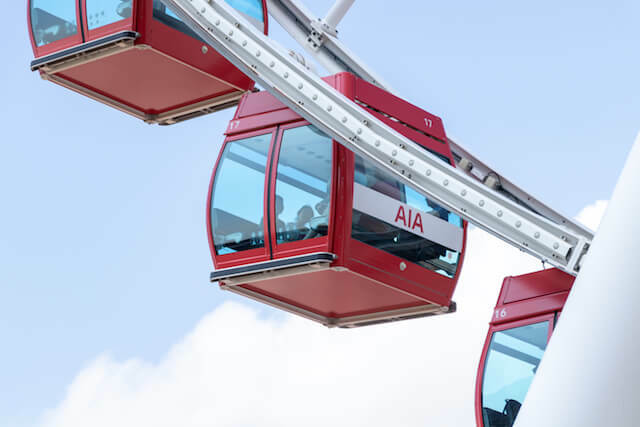 The wheel's 42 air-conditioned gondolas hold between 8 to 10 passengers. 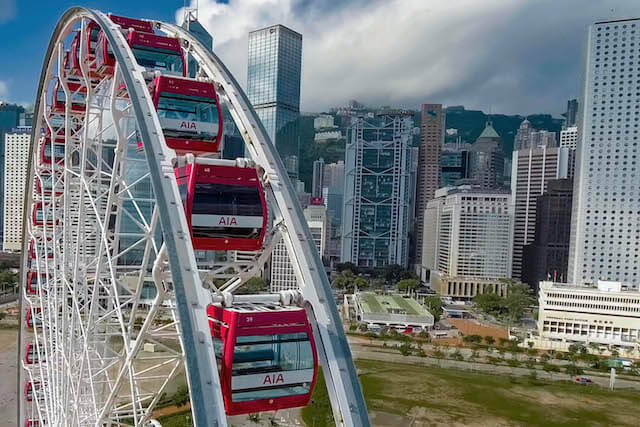 The gondolas are smaller in comparison to the London Eye's or Singapore Flyer which hold a couple dozen people and unlike the London Eye and Singapore Flyer capsules where you get to walk around, the Hong Kong Ferris Wheel is for sitting passengers only. The ride lasts approximately 15 minutes, 15 minutes of unobstructed 360 degree views of one of the world's most iconic skylines and its stunning harbour. And while you're here, take advantage of an array of FREE wellness activities, yoga, dance, cross fit classes, kickboxing, etc. at the adjacent AIA Vitality Park or stroll through the many AIA Vitality Stations offering resistance training, stretching stations and water fountains. 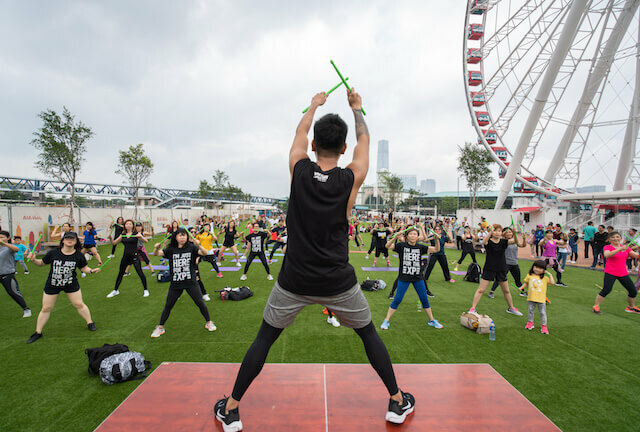 And beyond health and fitness, there are many arts, entertainment, heritage and community activities going on, whether it is some dance demo, sport tournament, a special concert or food carnival. And of course, with the many seasonal events there is always something going on, keeping this wonderful harbour front space vibrant and full of life... slides in the summer, lions and dragons for Chinese New Year, etc... Check their FB Page for any events happening during your visit! Getting There: The wheel is located in the area between Central Piers 9 and 10. You can't miss the big Ferris Wheel in the waterfront. 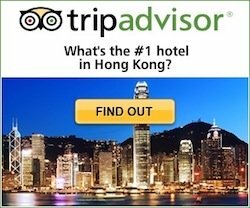 It is easily reached with the Star Ferry or the MTR, Central or Hong Kong Stations. How Much? : HK 100 for adults, HK 70 for children under 12 and students, HK 50 seniors and the disabled. NEW PRICING! HK20 per ride, HK10 for Seniors, Children under 3 FREE. Book your ticket online to reduce waiting time. 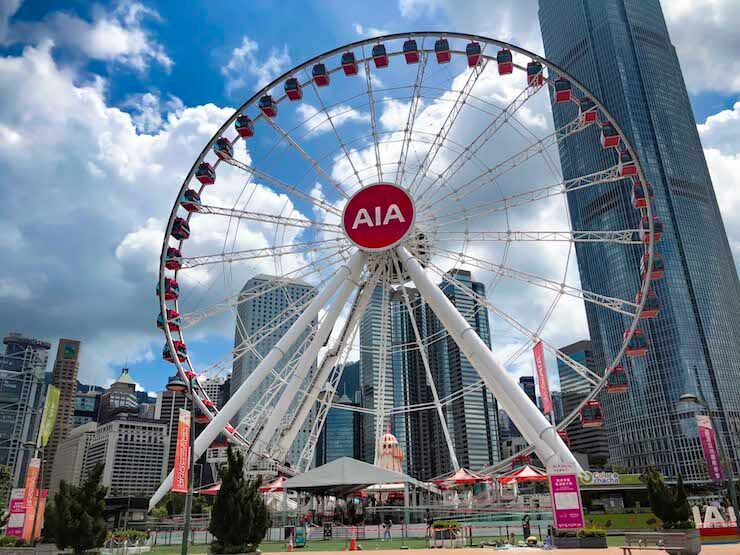 More Info and tickets: Official site of the Hong Kong Observation Wheel.